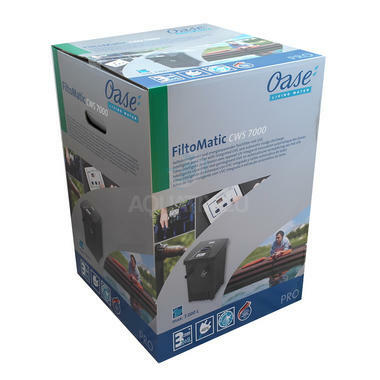 The Oase FiltoMatic CWS range of pond filters are a pioneering filter technology innovation. An automatic self-cleaning filter that autonomously monitors virtually all of the loads that can upset the balance in the pond and thus ensures clean water - 365 days a year. Filtomatic 7000 is a reliable and high quality filter for your ponds needs. With the intelligent control unit the UVC clarifier is activated manually or automatically and the filter is cleaned by the sludge pump that is also contained in the filter. Innovative self-cleaning filter set with: Integrated UVC clarifier Integrated pump system for sludge discharge Intelligent control unit: Regulates interval cleaning and UVC Controls sludge discharge via the sludge pump.